SQL Server Views are virtual tables that are used to retrieve a set of data from one or more tables. The view’s data is not stored in the database, but the real retrieval of data is from the source tables. When you call the view, the source table’s definition is substituted in the main query and the execution will be like reading from these tables directly. Views are mainly created for security purpose in order to restrict user access to specific columns i. These are also created for simplification purpose in order to encapsulate frequently executed, complex queries that read from multiple tables each time. Views perform multi-tables reading too, causing huge amount of IO operations. There are no performance benefits from using standard views; if the view definition contains complex processing and joins between huge numbers of rows from a combination of tables, and you are calling this view very frequently, performance degradation will be noticed clearly. To enhance the performance of such complex queries, a unique clustered index can be created on the view, where the result set of that view will be stored in your database the same as a real table with a unique clustered index. The good thing here is – the queries that are using the table itself can benefits from the view’s clustered index without calling the view itself. Maintaining the clustered index of the view to be unique, the data changed on the source table will be easily found and the change will be reflected to the view. Changing the data directly from the indexed view is possible but shouldn’t be done. Also, it is possible to create non-clustered indexes on a view, providing more possibilities to enhance the queries calling the view. You can benefit from indexed views if its data is not frequently updated, as the performance degradation of maintaining the data changes of the indexed view is higher than the performance enhancement of using this Indexed View. Indexed views improve the performance of queries that use joins and aggregations in processing huge amount of data and are executed very frequently. The environments that are best suited to indexed views are data warehouses and the Online Analytical Processing (OLAP) databases. On the other hand, it will not improve the performance on tables with many writes and updates such as Online Transaction Processing (OLTP) databases. Creating indexed views differs from creating normal views in that using the SCHEMA BINDING hint is not optional. This means that you will not be able to apply structure changes on the tables that may affect the indexed view unless you alter or drop that indexed view first. In addition, you need to specify two parts name of these tables including the schema with the table name in the view definition. Also, any user-defined function that is referenced by the created indexed view should be created using WITH SCHEMABINDING hint. Once the Indexed view is created, its data will be stored in your database the same as any other clustered index, so the storage space for the view’s clustered index should be taken into consideration. Having the indexed view’s clustered index stored in the database, with its own statistics created to optimize the cardinality estimation, different from the underlying tables’ statistics, the SQL engine will not waste the time substituting the source tables’ definition in the main query, and it will read directly from the view’s clustered index. Another restriction on creating an indexed view is that there are a few SET options that should have certain values in your database if you manage to create an indexed view in it. For example, the ANSI_NULLS, ANSI_PADDING, ANSI_WARNINGS, ARITHABORT,CONCAT_NULL_YIELDS_NULL, and QUOTED_IDENTIFIER options should be ON, and the NUMERIC_ROUNDABORT option should be OFF. Non-deterministic columns can’t be used in the indexed view definition. These are the columns that don’t return the same value each time, like the GETDATE() function. 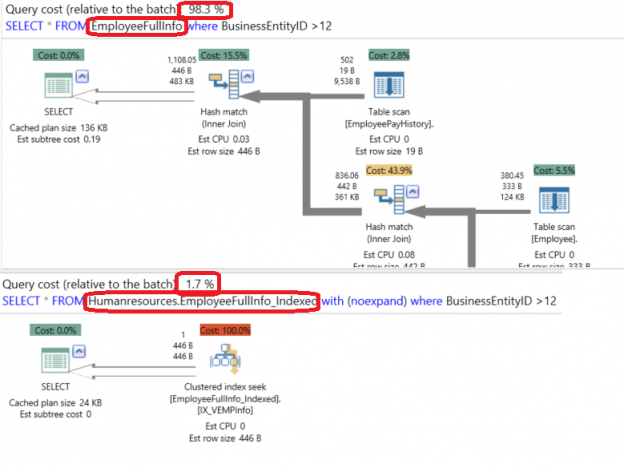 Benefits of clustered indexes created for an indexed view depends on the SQL Server edition. If you are using SQL Server Enterprise edition, SQL Server Query Optimizer will automatically consider the created clustered index as an option in the execution plan if it is the best index found. Otherwise, it will use a better one. In the other SQL Server editions such as Standard edition, the SQL Server Query Optimizer will access all the underlying source tables and use its indexes. In order to force the SQL Server Query Optimizer to use the index view’s clustered index in the execution plan for the query, you should use the WITH (NOEXPAND) table hint in the FROM clause. Let’s review a small demo to test and compare the performance of a standard view and an indexed view that will read the employee information required for his manager from the Employee, EmployeeDepartmentHistory, Department, Shift and EmployeePayHistory tables under the HumanResources schema from the SQLSHACKDEMO database. As we can see from the query’s execution plan generated using the APEXSQL Plan application, no performance benefits are achieved from this view, as the SQL Server Query Optimizer reads the data from the source tables performing Table Scan, ending with the below complex plan. As you can see from the execution plan generated using the APEXSQL Plan application, it looks totally different; rather than having the five tables’ scan, the SQL Server Query Optimizer determines that using the view’s clustered index is the optimal way to get the requested data from the view. It is clear that the optimizer reads all the data from the clustered index itself without touching the underlying tables.